Incredible! An 11th post devoted to just one puzzle type and manufacturer. In January I began to update my Livewire puzzles sojourn with a look at the most recent ones added to their site. I am very sad to see that they have discontinued several of my absolute favourites from my previous posts. They have a huge range and some are absolute blinders! Have a look here for some of the older puzzles. So the next one in the series that I picked up was the Roller Coaster - this is the very latest addition to their catalogue and I was very lucky to be offered the chance to buy it before it actually came on the market. It has a striking similarity to the Ringleader that I reviewed last time, with the big beautiful spiral. 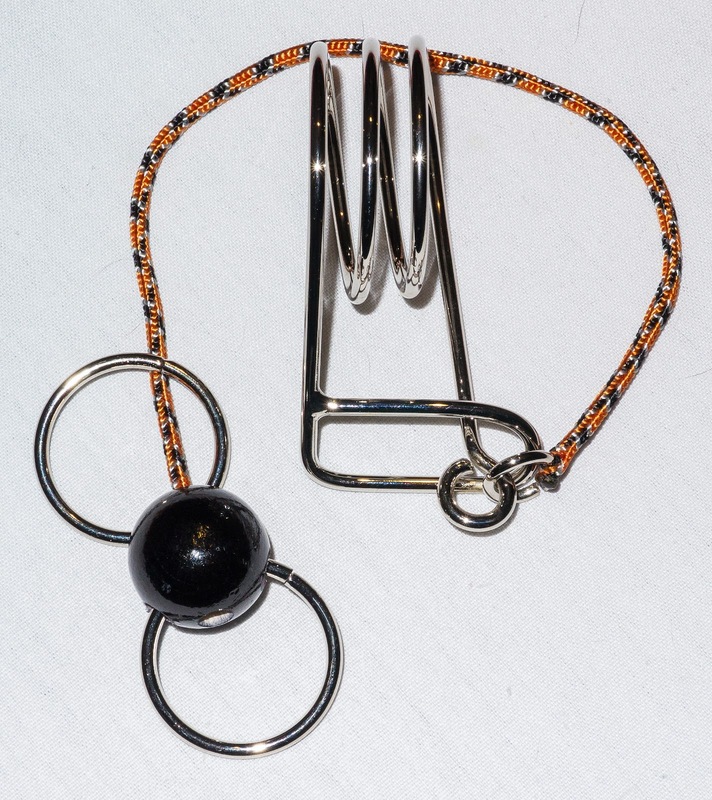 This spiral really complicates the solving process and gives you the dreaded opportunity to not only tie the string in knots but also to have it wound around and around the spiral. Livewire have rated this one as "Very Difficult" and hell yeah! it certainly is. Having picked this up and had a quick fiddle, the one thing that struck me was that it bares a remarkable resemblance to a classic puzzle - the Ball and Ring puzzle. There have been many versions of this and it was described on page 154 of the classic book "Creative Puzzles of the World" by Pieter van Delft and Jack Botermans. Now the original ball and ring puzzle caused me some real problems - there should be only 1 solution which is very counterintuitive and the version from Livewire was a struggle for me. I also have another version which has 2 solutions - one I think is unintended due to the size of one of the pieces. My original supplier for that one has ceased to sell them but it is now made by GoGames and sold as the Heavy Metal Aces Up puzzle. So, having noticed the similarity, I immediately went to my metal puzzles drawer and tried to find them. This proved to be a bit of an issue! I seem to have rather a lot of puzzles in these drawers and it took me a while to hunt them down - partly because I kept getting sidetracked by lots of other shiny toys! An old photo - I have quite a few more now!! Now where did I put that wire puzzle?? I managed to solve the Heavy Metal Aces Up puzzle the "wrong" way fairly fast but couldn't find the alternative solution at all! 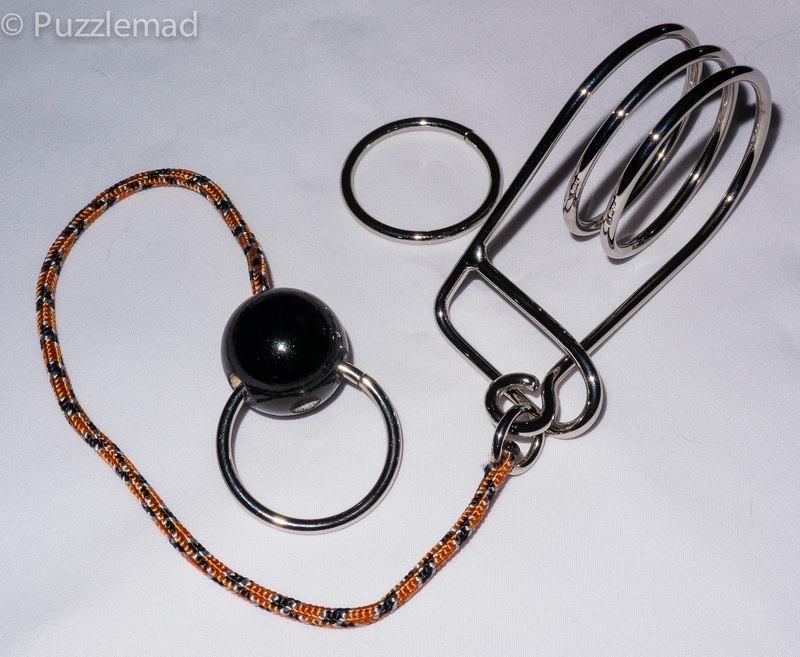 I then moved to the Ball and Ring puzzle and have to admit that I really struggled with it but after about an hour of swearing, I finally worked out the method! So next it was on to the Roller Coaster puzzle. The basic process is very similar but the helical section really adds to the challenge. You have just enough string to solve it but there's plenty to also get into a fairly awful knot! At one point I thought I was going to have to dismantle it, as the knot I created was epic in proportion! But the gods were watching me benevolently and it dismantled with a bit of effort. Finally the ring came off and I could take a photo. Putting it back is "just" the reverse but I managed to create an unnecessary loop in it somehow and spent another hour or so effing and blinding before I did it properly. Phew! That took a lot of effort! 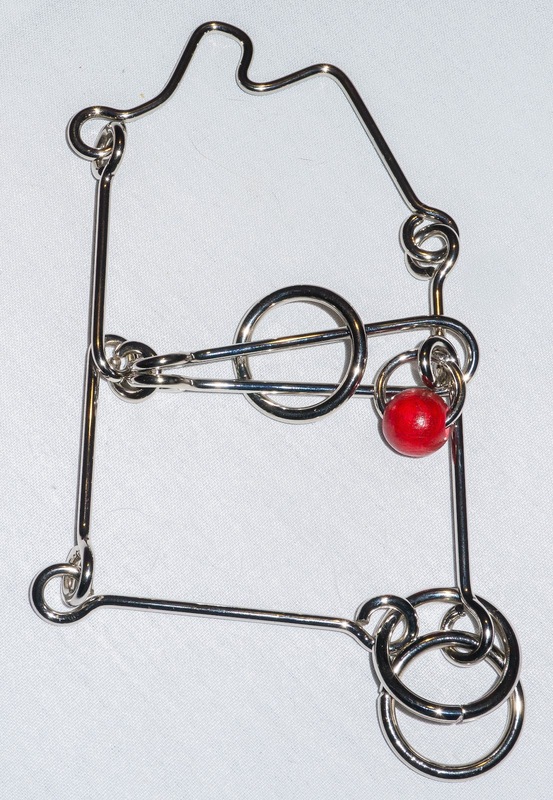 I love this puzzle - it takes the classic (and still very challenging) Ball and Ring puzzle and adds a beautiful twist. As with all of Livewire's puzzles, it is very nicely made and well worth adding to your collection. The House Arrest puzzle, I managed to get just in the nick of time as it has very recently been discontinued. I think that this is a real shame as it is absolutely terrific. It might be worthwhile nagging them about it and seeing whether they will bring it back or have any left in stock. The aim is to remove the ring (obviously!) and, like a few others with similar shape, the exit point is very well disguised. They had rated it as merely "difficult" but I would say it is harder than that. Due to the many joints in the structure it is extremely flexible and that really makes it hard to find the exit. I had managed to solve the Pentangle puzzle which is the same as the Fantastic Five puzzle from Puzzle Master with some considerable difficulty and thought that this would help me. I was wrong as usual. I played and played for days with this one and just couldn't find an exit point - in fact I couldn't remember what moves I had tried and this may have contributed to my problem. Stepping back and looking at it just didn't help. I often find that looking at a puzzle will sometimes let the mind jump to a solution or an approach but this one was so complicated that nothing ever sprang to mind - it is definitely a hands on puzzle! Finally, when I was being harangued for being a lazy B and not doing anything around the house, I folded it a certain way and suddenly I could see it. A minute later, before she whacked me, I had it apart! No clues for you I'm afraid! Maybe if enough of you clammer for it, they might just bring it back. I absolutely love this puzzle! I have handed it to a couple of friends and no-one has come even close to finding the solution. At least it can't be knotted up! There's one more from the last batch but I will save that for another day - next I must proudly say that I have managed to help a hero of mine! 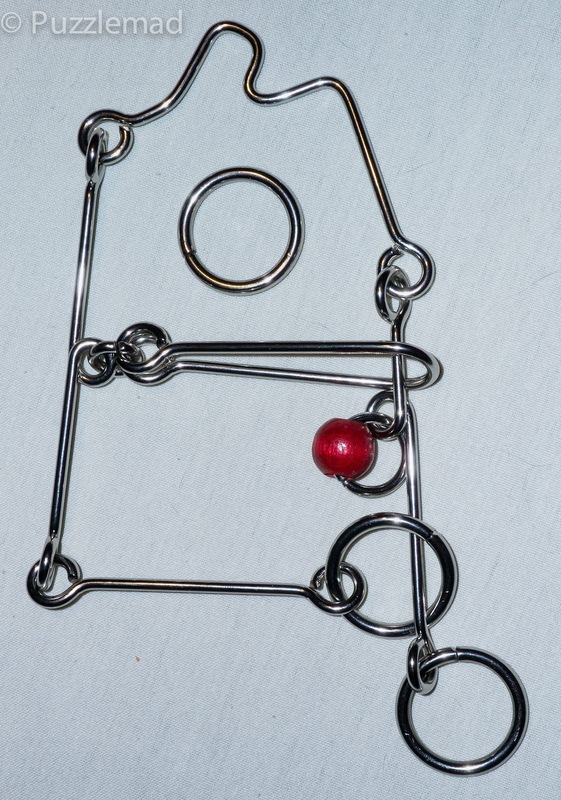 In January last year I wrote about another fabulous wire puzzle, the Two Ring Teddy, which I bought from Wil Strijbos. It is a beautifully simple looking puzzle which almost everyone can disassemble in just a few minutes, but very few people ever mange to remember what they did and the reassembly is very hard indeed - it took me an embarrassingly long time! For the last 6-8 months I have sort of become Wil's troubleshooter - he does not have time to give solutions and his puzzles don't get supplied with them. People who are struggling sometimes get referred to me. Some of Wil's old friends asked for help with the Two Ring Teddy and the request was sent to me to provide assistance. Imagine my surprise when I saw that one of the people asking was none other than David Singmaster! I had an original Hungarian Rubik cube in 1979 and had even worked out how to solve it but when I wanted to get faster, I had obtained a copy of David's book in 1981. I made a video of how to put it together and hopefully I have managed to help out one of my childhood hero! Today Livewire announced that it is introducing a new series of wire puzzles specifically designed to baffle Kevin. These will all contain at least 3 feet of string, with plenty of knots already introduced to confuse him further. All are especially noisy for the amusement of Mrs. S.
Shh, not even the designers have been able to solve them. Look for a mystery box filled with the new "Deadwire" puzzles!!! Also included will be a trivial packing puzzle with one additional piece that slipped in there somehow. Happy puzzling, Kevin! George, I would absolutely love it if they would bring out some more puzzles! I seem to be running out of commercially made disentanglements and am always looking for more!